This book on the first chapter of Genesis is not concerning the literal creation of the universe. There are more than an ample supply of commentaries and other writings on how God created the earth and the heavens. 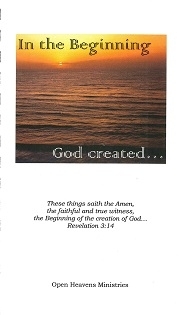 In Revelation 3:14 Jesus refers to Himself as the Beginning of the creation of God. We know that Jesus was not created, for He is eternal. Colossians 1:6 says all things in heaven and in earth, both visible and invisible, were created by Him. So the question arises: In what way was Jesus the Beginning of the creation of God? It becomes very obvious that the creation account in Genesis chapter one is mystically speaking of the creation of the Body of Christ. Enjoy the study.